Popularity of the use of dentures has increasingly grown in the past few years. With most people using dentures being advanced in age, there are others who turn to it for health reasons or some even have their real teeth removed due to lack of care. With dentures needing special care just as natural teeth would, the right products should be used. In this case this review focuses on the Denture Bath and Brush Set, its features, specifications, advantages based on customer feedback, its drawbacks and summary of the product. The Denture Bath and Brush Set is the complete package when it comes to a product that offers an inexpensive way to maintain dentures. The back to back denture bush works well to clean both large and small surfaces for a thorough cleaning. The case is made of durable plastic that can withstand impacts and can be used for a long time. It measures 5 in with the cleaning cup measuring 4 in wide and 3 in tall. With a depth of 2.4 in, dentures sit comfortably at the bottom of the case. Cleaning is extremely easy as it’s dishwasher safe. Click here to purchase Denture Bath and Brush Set from Amazon! The Denture Bath and Brush Set remains air tight when closed. This guarantees that when one is traveling the dentures do not fall out, getting lost. Also, it leaves no room for leakage whatsoever. In addition it’s the perfect size. By neither being too deep or too shallow, getting the dentures out of the set itself is easy, as one does not need to dig too deep. The denture brush itself is not only the perfect size but also has the needed texture to ensure that all areas of the dentures are cleaned when one brushes them. Still, it’s the perfect texture for cleaning all types of dentures. Although the advantages of the Denture Bath and Brush Set are numerous, there are a number of concerns that come with it. The main one is that it’s a bit difficult to open once it is closed. This comes about as it has a smaller than usual lip to grab. In this case most customers usually just lower the lid instead of closing it during the night if they are at home or in a hotel. This can also be a good thing, however, because dentures stay inside the case while traveling without any leakages reported. 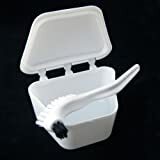 Most people applaud the Denture Bath and Brush Set for the simple reason that it is small enough to carry when traveling. The best part being that it does not leak or release any residue. However, there were some gripes about the fact that it only comes in one color. Still, it offers a peace of mind as its deep enough to accommodate dentures without making it difficult to get the dentures out, making it particularly useful, with most buyers recommending it. All in all, the Denture Bath and Brush Set works as advertised, offering an easy way to clean and brush off the dentures while on the road. All things considered, it’s highly recommended and has a solid rating of four out of five stars, based on findings.